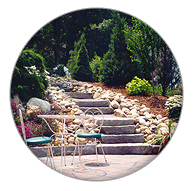 Rely on the professionals at Matthew R. Foti Landscape Design and Construction for all of your landscape design needs. We provide basic in house design services and work closely with a large array of Landscape architects if you require more detailed plans. One of our specialties is salvaging existing plant material and incorporating mature plants in reconstructing a landscape. Matt has a large selection of mature plants to choose from at any one if his 3 growing locations in addition to sourcing plant material up and down the east coast. Matthew R. Foti Landscape Design & Construction can also provide subcontracted landscape masonry and irrigation systems. Matthew R. Foti Landscape Design & Construction is a full service landscape design and construction firm established in 1977 and has maintained a 41 year commitment to high quality workmanship and personalized customer service. As a long time educator of aspiring arborists and horticulturalists, Matt's construction crew employs the most up to date planting and transplanting methods that will ensure the health and longevity of your landscape. Our continued education in a constantly changing industry combined with state of the art equipment has made us one of the leaders in our field. Current member of the Massachusetts Arborist Association and the American Society of Consulting Arborists. Matthew R. Foti Landscape Design & Construction, Inc.